Here’s the view as you drive up to the house. It’s your average, builder basic brick home, complete with cracked driveway, algae on the walk, overgrown plants, and a quarter-of-a-sunburst missing from the garage door. Not to worry. We’ve got plans for you, ugly concrete and shrubs. Off to the left/east side of the foyer (what appears to be the right from the above pic) is the guest hall, where the two smaller bedrooms and guest bathroom coexist, along with a linen closet. Not much to see here, except for your first taste of the brownish shag carpet. Delicious, right? This bedroom is on the front/north facing side of the house, which means it will stay cooler than all the other rooms in the house–not a bad thing in Florida, though winter does get a bit chilly in here. We have snow/ice at the beach right now. Crazy, right? We love the big window, as it helps the room not feel quite so small (10 x 11 plus closet), though we aren’t a huge fan of the current blinds. 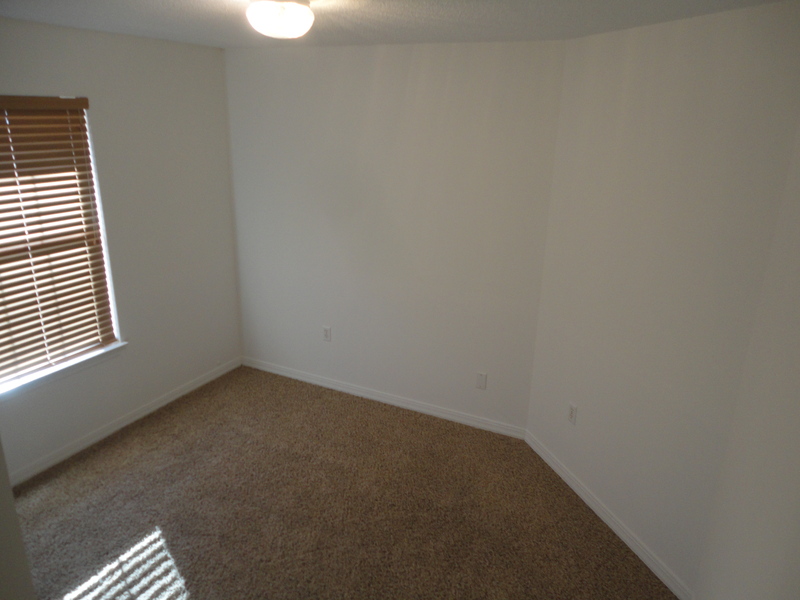 We envision this room functioning as the guest room initially and a kid’s bedroom eventually. 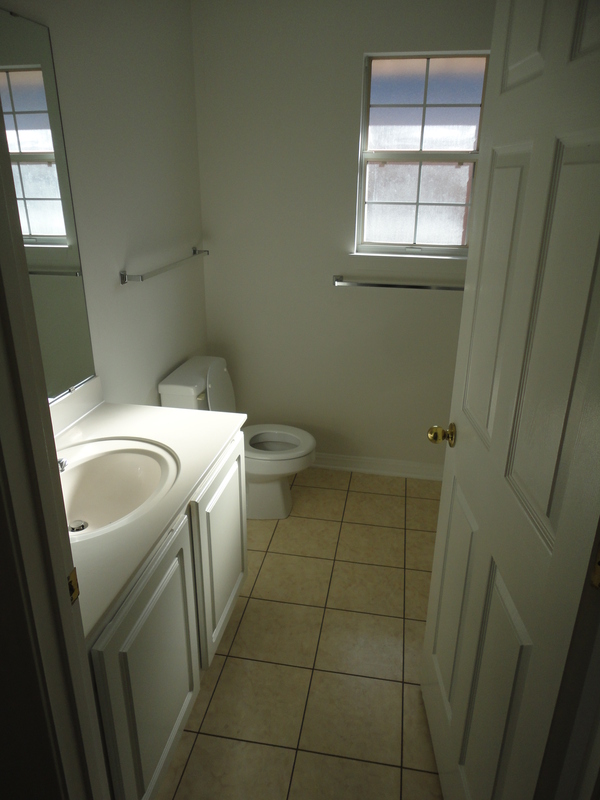 This is the guest bath, which is surprisingly spacious, though the space isn’t all that useful. At least everything is in working order. 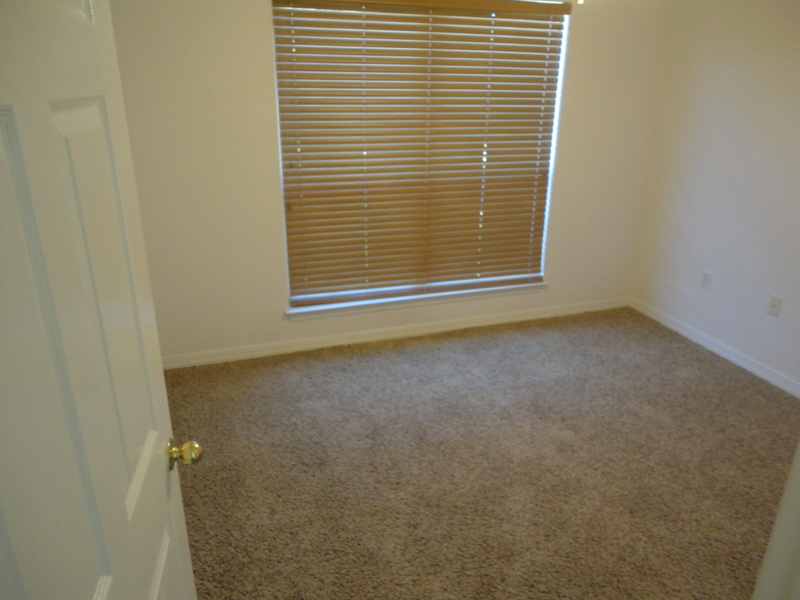 This bedroom is also 10 x 11, with a weird, angled wall making it even smaller (and harder to photograph, obviously). This is apparently a signature ‘feature’ this particular builder includes (we are not impressed). 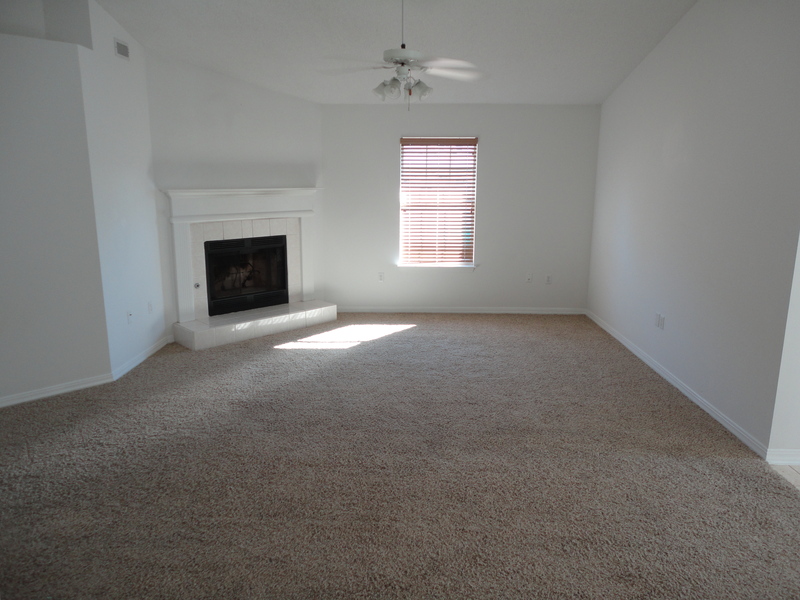 We envision this room serving as a spare bedroom for now and future nursery/kid’s bedroom. 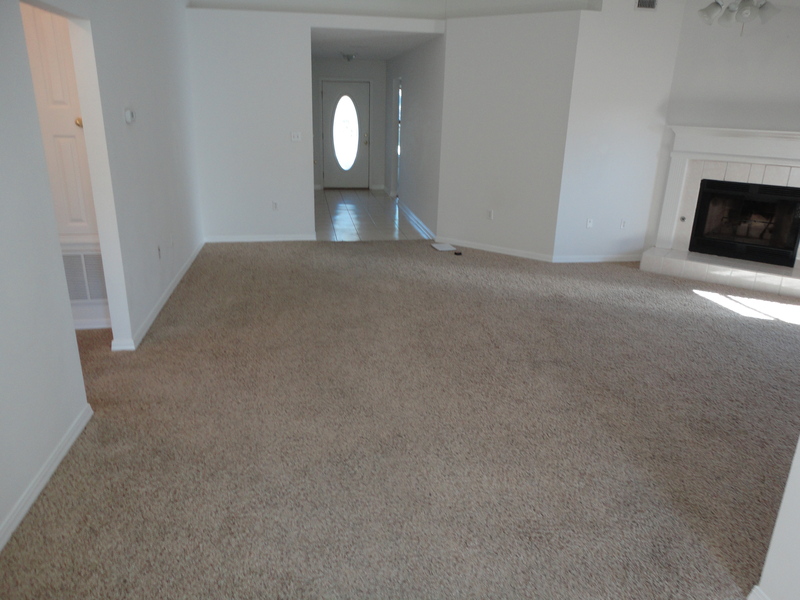 If we go back out to the foyer, it opens into the main living area, complete with dysfunctional gas fireplace that people used to burn wood (scary, right?! ), awkward window smack in the middle of the small east wall, the other side of the weird angled wall, a plant ledge that is probably harboring little bug carcasses because no one can reach it to clean it (another builder “feature”), more of the shag carpet and white walls, but a nice high ceiling which makes it feel more spacious than it actually is. The other ‘nice’ feature is this seemingly awkward nook that will be the perfect place for Black Beauty (my baby grand). Off to the west side of the living room (what appears to be the left from the picture view above) is the hall leading to the laundry closet and master suite. 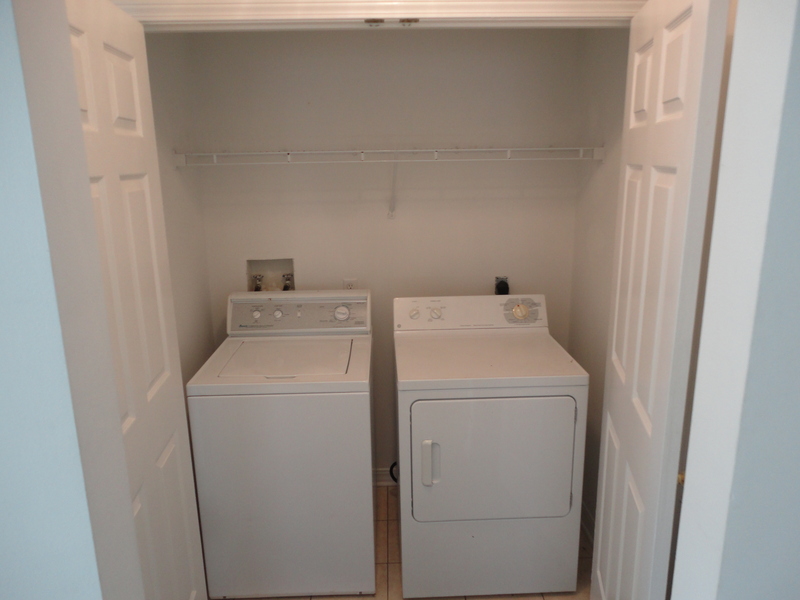 I’m not thrilled about only having a small laundry closet, but plans are forming for ways to maximize the space we do have by going vertical and adding a countertop over our front-loading washer and dryer. The washer and dryer you see in these pics will be Craigslisted once we move ours down from the city. 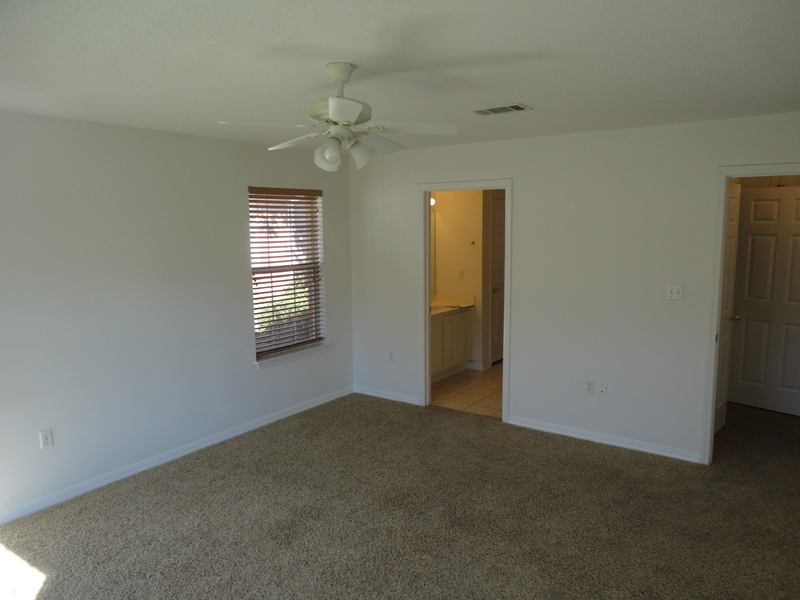 More white walls and shag flooring, but with a nice big window. The master is on the back/south facing side of the house, which is wonderful because I have trouble waking up without plenty of sunlight streaming into my eyes room. 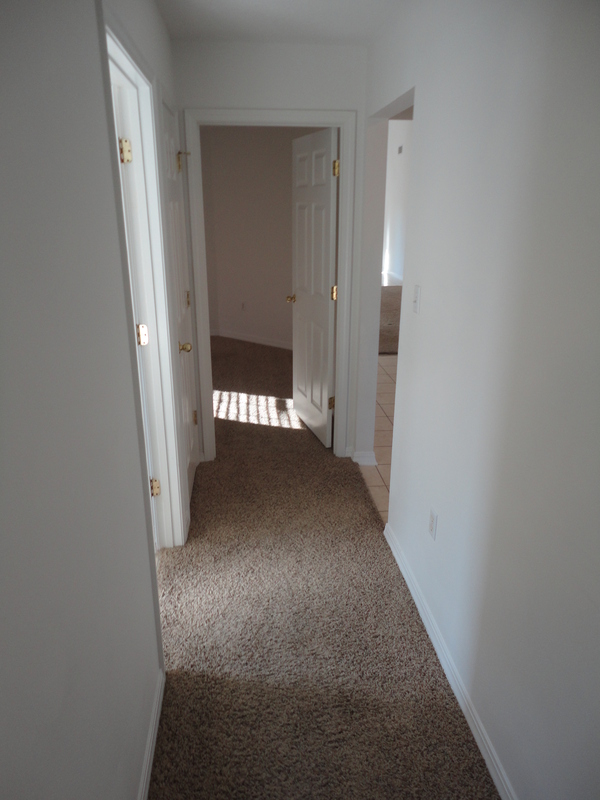 I also plan to have my sewing desk in here, so the southern exposure will provide plenty of natural light all day long. The west side window is a little awkward because it looks right into our neighbor’s kitchen (I can see her spice rack, and she can see my lingerie…what?! ), so we will be brainstorming some more stylish solutions for windows ASAP. 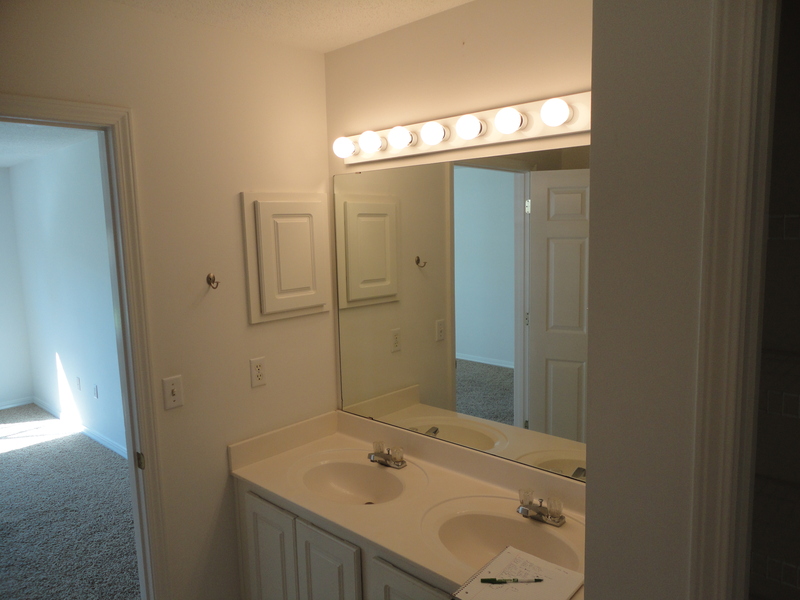 From the master bedroom, you enter the master bath “double vanity” sink area. Just because there are two sinks doesn’t mean it should count as a double vanity. Seriously, there’s no counter space at all. My husband’s stuff takes up this much space, and there’s only one puny medicine cabinet. 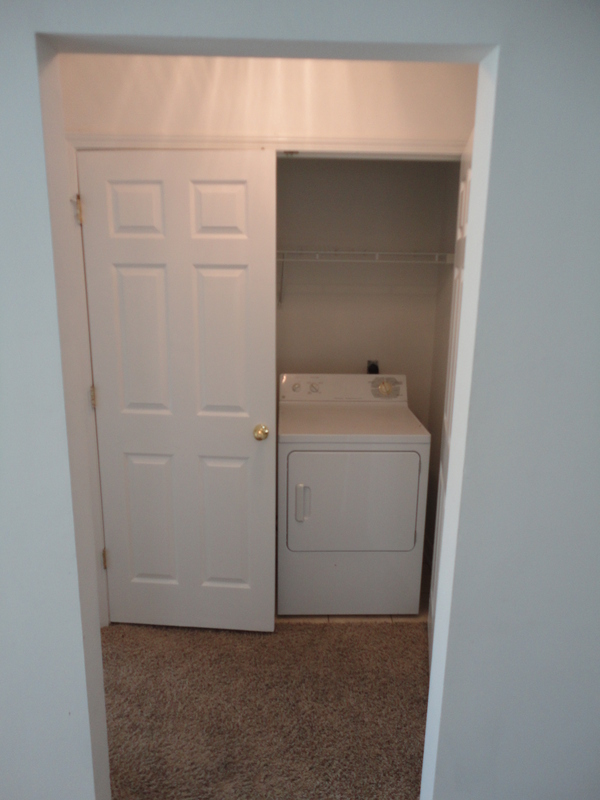 I suppose the builder thought he solved the storage solution by adding a linen closet, but it is awkward with three doors (linen closet + WC + master closet) coming together in the same microzone. 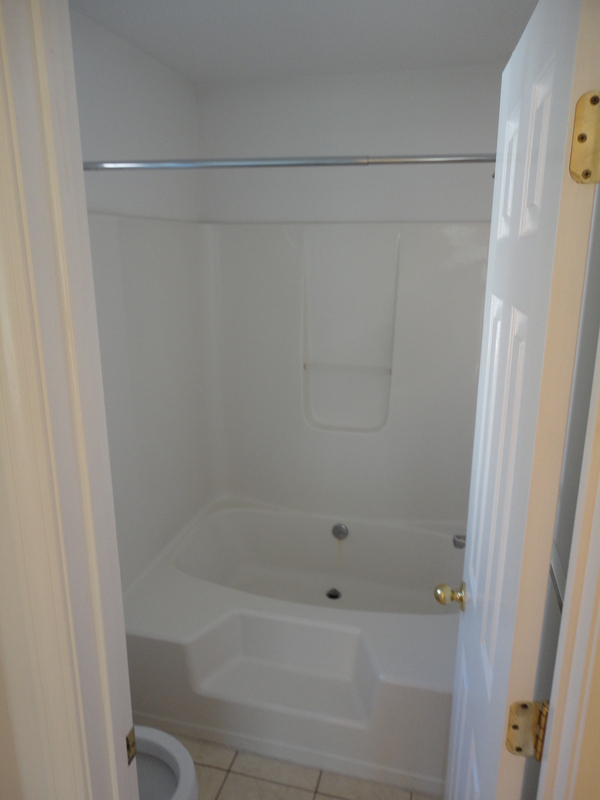 Speaking of doors, let’s enter the master water closet/shower/tub area. Well, maybe we’ll just peek inside. As you can see, it is really cramped, and we are also bummed about not having a separate tub and shower. This tub is also weirdly shaped for showering and shower rods/curtains, so we may have to think of a better longterm solution. 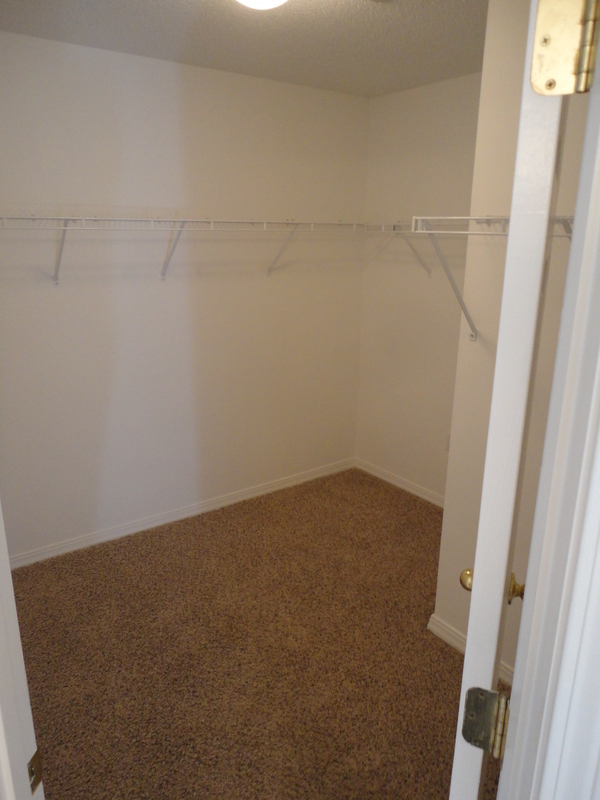 The other door in the bathroom leads to the master closet, which is a nicely sized walk-in closet. In the future, we may have to borrow some space from this closet if we want a separate tub/shower, but we want to spend some time getting a feel for the space before we start tearing down walls and moving plumbing. Time will tell. 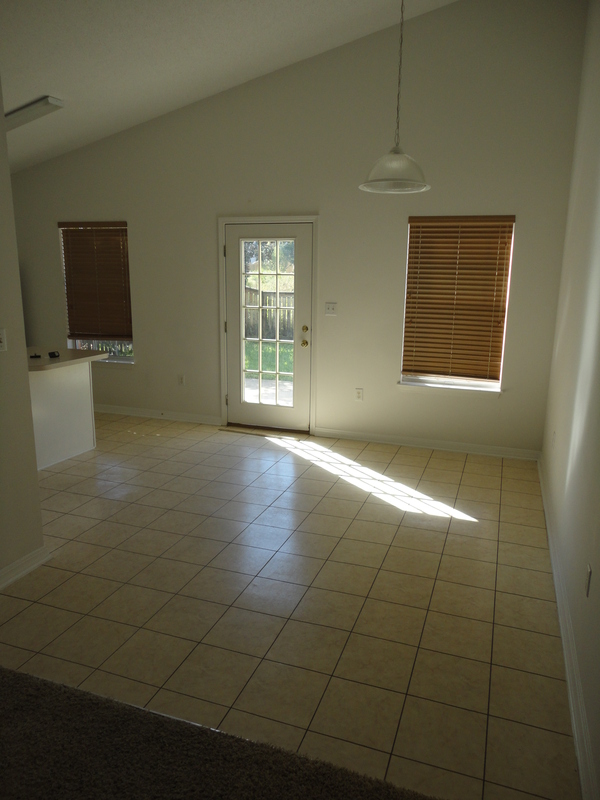 We really love the kitchen, despite more of the white walls, vinyl tile, and builder basic cabinetry and appliances. Why? Because we have gas. We also like the layout, though we plan to rotate and enlarge the island. We also have a decently sized pantry. 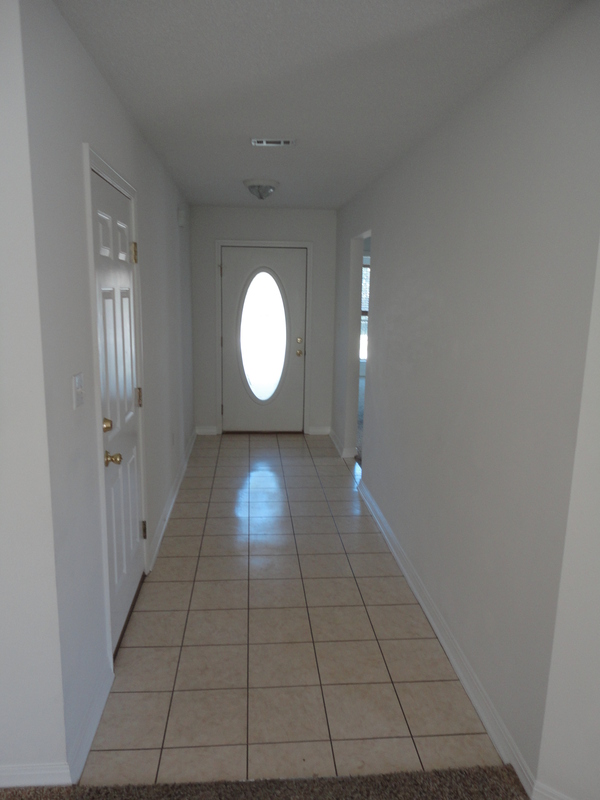 Best of all, the windows face east and south; plenty of natural light, because who doesn’t like to see if the eggshells accidentally landed in the mixing bowl? When your vision is like mine, light is important in the kitchen. REALLY important. Dark kitchens are the worst. From the kitchen/dining area, you walk out to the backyard and patio. 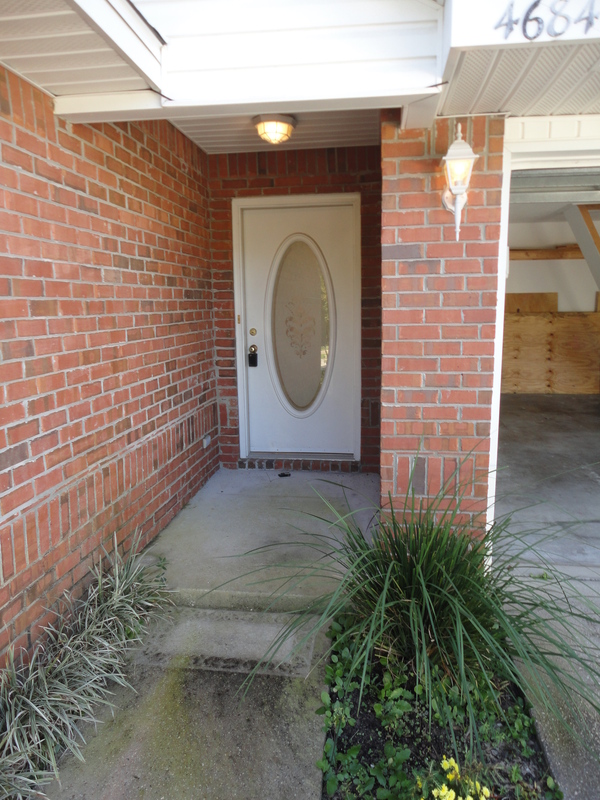 Like the front concrete, the patio is cracked and stained (but nothing a little pressure washing won’t help!). We have some shrubs and palms that will not be staying, for a number of reasons, as well as a sprinkler system that uses well water. Behind the backyard is the wild jungle easement for the electric company, which means no one will build behind us, and it gives us extra space from our neighbors, something that you don’t come by easily in coastal areas. The electric company allows you to cultivate the jungle as long as you don’t plant tall trees or put permanent structures there, so a number of the neighbors are using this area for gardens. Yay fresh produce! If you exit the gate on the east side of the backyard, you will find yourself on the main east side yard. Nothing much to see here…yet. If you walk back around to the other (west) side yard, well, we‘ll just let the pics speak for themselves. Let’s just say, the whine of a chain saw will soon be heard. Cower in fear, all you overgrown trees and shrubs taking over the eaves of the house. Just to clarify, we aren’t those people who get rid of all landscaping to have a lush lawn; we definitely trend towards a variety of plant life but prefer to use native (and drought-resistant!) plants in Florida. We’ll replace what we take out with plants suited to the respective sites that are easier to maintain and easier on the eye. Sorry, magnolia threatening to fall on our roof in a hurricane. So there you have it. We know it doesn’t look like much right now, but it’s a fairly clean slate. In the meanwhile, we are generating ideas for how to fix this place up, so we’ll be sharing our plans for greatness in the near future. For real this time. Note I didn’t commit us to a particular date….